Photo by Frank Jordan, Glover’s Reef Resort, Glover’s Reef Atoll, Belize, May 2010. Lionfish are quite beautiful and distinctive fishes that are characterized by bright red, white, and black banding and large, showy dorsal and pectoral fins. The bright coloration is a warning to potential predators, because lionfish are also characterized by the presence of highly venomous spines in their dorsal, pelvic, and ventral fins. Nine species of lionfish (Family Scorpaenidae: Genus Pterois) are native to coral reefs in the Indo-Pacific, but they are maintained in saltwater aquaria around the world because of their striking coloration, graceful swimming, and other interesting behaviors. People likely have been releasing unwanted lionfish into the wild for sometime – unfortunately, there was a large enough release in southern Florida in the early 1990’s that two species, the red lionfish and common lionfish, are now established in the western Atlantic Ocean ranging from Rhode Island, throughout the Caribbean, and southward to Venezuela. More recently they have invaded the Gulf of Mexico and will likely spread throughout in short order because they reproduce year round, produce a large number of offspring, and have few natural predators. Envenomation of humans by lionfish is a medical concern throughout the newly established range of lionfish. However, the greater concern is the effect that lionfish will have on food webs of coral reefs. Lionfish feed voraciously on native species, including juvenile sport fishes such as groupers. Coral reefs are in severe decline globally and especially throughout the Caribbean. Lionfish could be the final insult that causes collapse of these highly diverse and productive ecosystems. Given these concerns, considerable effort is being invested into learning as much about invasive lionfish as possible with the goal of identifying and mitigating their negative effects on marine ecosystems. I am contributing to this effort by collaborating with my students on studies of the activity patterns and feeding habits of lionfish at Glover’s Atoll reef in Belize. We have found that lionfish are feeding on almost any fish or shrimp they can fit into their rather large mouths and they are most active during crepuscular periods (dawn and dusk). The activity information is valuable because it suggests that monitoring and hunting of lionfish, especially when not using SCUBA, should be focused during crepuscular periods to maximize capture efficiency. 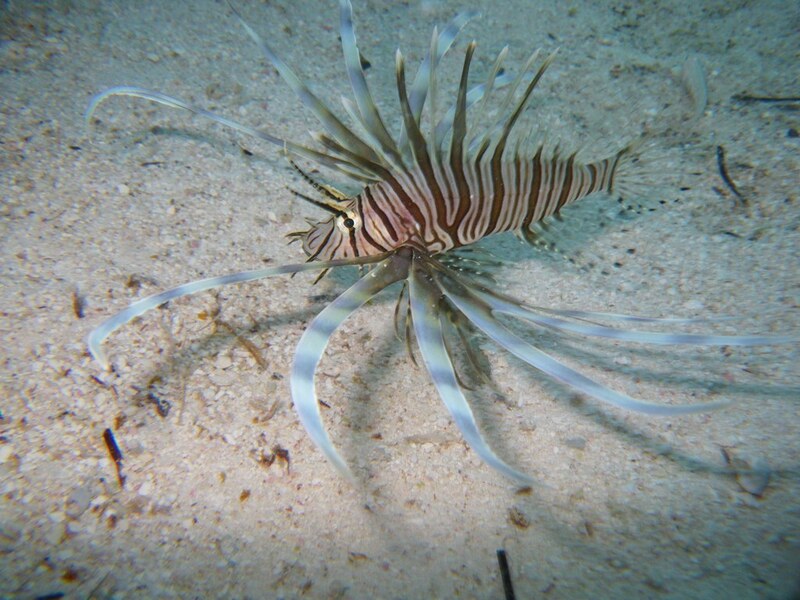 If you want to find out more, the document http://coastalscience.noaa.gov/documents/lionfish_%20ia2009.pdf and information on the associated NOAA website contains an excellent overview of the biology, ecology, and management of invasive lionfish.